Like any other day, 25th of May could also have been a normal day for us Paddries if one mega news could not have penetrated through the soft channels of social media and dropped on our Whatsapp groups to make it special. News that made our day and filled many hearts with ecstasy was nothing else than the sanctioning of long pending demands of Model Degree College Paddar and Industrial Training Institute (ITI). Here is the Government order No. 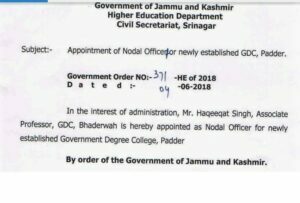 365 HE of 2018 dated 01/06/2018 regarding the permanent establishment of Government Degree College in Paddar. It took 32 long years for us to get college sanctioned from the Government. Quoting one famous Persian phrase ”Der Aayad Durust Aayad” fits well here because of two reasons. Second, it has got its nod with a gift of another much awaited demand of the people of Paddar, which is of ITI (Industrial Training Institute). Here is the Government order sealing the rumors of the establishment of ITI in Paddar. Here is the tweet of Sh. 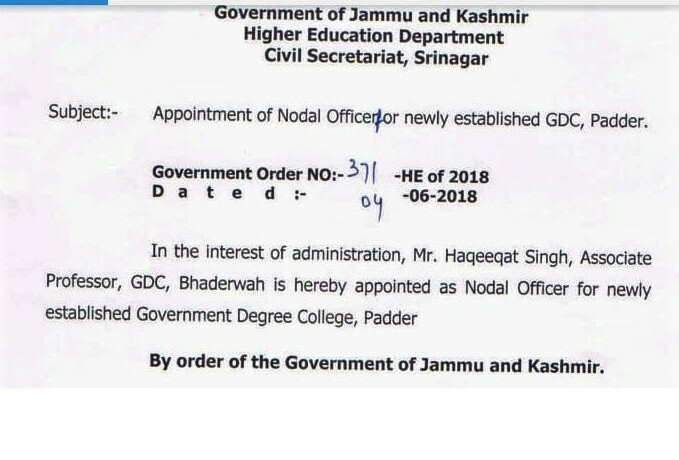 Sunil Sharma informing regarding the appointment of Nodal Officer as the highly talented educationist, who happens to be the local of the area Mr. Haqeeqat Singh (Assistant Professor). 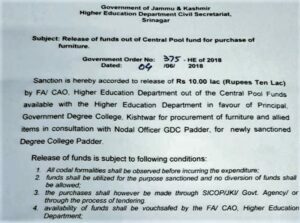 Also, immediate funds to the tune of Rs.10 lacs have been released for obtaining the furniture for Govt. Degree College Paddar. Formal orders for the Posting of Nodal officer and immediate allotment of funds at first instance. The copies of formal orders below for your information. People of Paddar struggled for these basic things, for the last many years, even before the previous Govt. was overturned by the incumbent one. Many students, I had seen in the past left their studies in the middle after 12th because of some financial problems. Every year I saw students leaving their village in the winters to make their ends meet in the cities by toiling day and night in the factories. They had no choice other than becoming laborers in the salad days of their life.Some of fortunate ones who could afford, completed their technical degrees from the nearby town Kishtwar which is 65 kms away from Paddar with the hope of getting jobs in the upcoming hydroelectricity projects. We raised our concern multiple times before the people sitting at the helm of affairs but every time we approached them, they turned it down. Our demand of college seemed completely illogical and irrational to them. 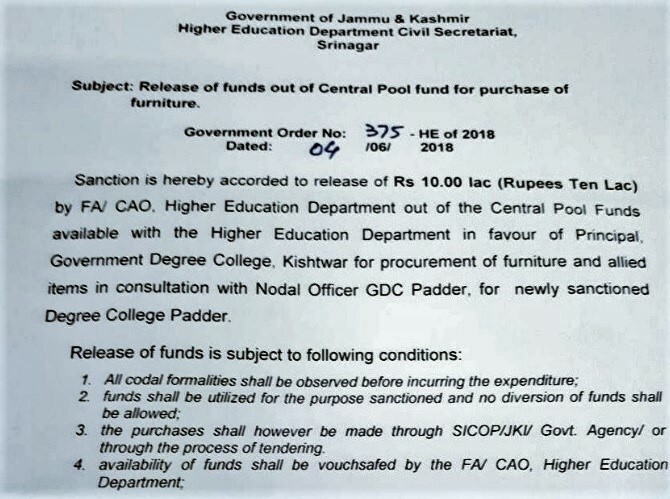 Recent sanctioning of colleges by the state govt. is a testimony to this fact. But that didn’t shatter our beliefs. This feeling of sheer monotony among the masses paved the way for change in the leadership who would consider their demands genuine. Their deciding votes changed the course of history and a new leader in the form of Sh. Sunil Sharma was chosen as a new MLA from the district. He promised before the people of Paddar with his emotional speech that he would do whatever it takes to shape their demands into reality. He was elected a law maker but his coming into power didn’t do anything better in the starting 3 to 4 years for the people of Paddar. Associations geared up, articles began to ring the bell to remind him of the promises he had made in the past. He made efforts in this direction, no doubt. On 23rd of May 2018, due to Mr. Sharma’s continuous efforts our demand of college reached at the desk of HRD ministry under the ministerial-ship of Sh Prakash Javdekar. and Dr. Jitender Singh MoS in the Prime Minister’s Office and MP from the Udhampur Parliamentry constituency also coordinated our Minister Mr. Sunil Sharma in this task and finally on 25th of May, College was sanctioned in the meeting of PAB (Project Approval Board) under RUSA. People of the Paddar are thankful to them for considering their demands genuine. There was a feeling of disbelief in the beginning when we first heard of it but this suspicion immediately met a strong blow and the reality began to slowly sink in when we saw the tweet and post on facebook, of Hon’ble (MoS) Dr. Jatinder Singh and Hon’ble Cabinet Minister Sh. Sunil Sharma ( State Cabinet Minister for PDD) respectively from their official Social Media handles. With the confirmation of this news, a tremendous surge of happiness spread along the nook and corner of Paddar. Funds of 10.8 crore rupees are said to have been allocated for the construction of college. People who were going bananas till few days back had a smile on their faces that very day. These institutions are definitely going to bring revolution in the canvass of Paddar, without a doubt. Now, there is a ray of hope that students would not leave their studies in the middle. The emotional connection that our Minister had made before the election with the people of Paddar is bearing fruit in the end, at least. So far, so good. Places for the construction of buildings have not been decided yet. Meetings after meetings are taking place with the people of Paddar. Regionalism is taking its toll. Classes are expected to begin by this year. But what matters to me the most in this atmosphere of delight and elation is that we do not have to be complacent. We had got what we truly deserved. It was our right. There are still many demands which are pending. There are still many villages in Paddar where there is no communication facility. Roads are another issue, many developments are taking place in this field though but still we are far away from the saturation point. Work at hydroelectric projects has not started yet etc. etc. There is no need of numbering, there are many, we all know that. Always remember there are no messiahs in reality, they only look good on television. In the end, I would like to say that if we really want to see these institutions become harbingers of change we need to struggle from the basic levels with more responsibility. Therefore, focus on increasing the pass out percentage at higher secondary level. Past results are not conducive to the changing atmosphere. I hope we would change for better. Drop in your views on the article in the comments section below and do share by clicking the social media icons if you liked it. V nice bro. And it was very good news for paddar. By this paddar will surely achieve some next level in education. 👍…. And its credit goes to off course Sh.Sunil Sharma g……..
Apart from the topic, i would say that your writing skills are appreciable brother.